You'll be £19.99 closer to your next £10.00 credit when you purchase Panzers in the Sand Volume One. What's this? In September 1939, the tanks of Panzer-Regiment 5 swept into Poland, a devastating part of the German blitzkrieg that opened World War II with a terrifying display of military force. The following spring, the regiment rumbled across France, again showing the destructive power of the panzer. But the unit’s greatest fame would come in the North African desert, where Panzer-Regiment 5 joined Erwin Rommel’s vaunted Afrika Korps as it battled the British back and forth beneath the scorching sun of Libya and Egypt. Not another regimental history! Many keen readers of this column will now be mouthing these words as they try to decide whether this one stands out from the rest. It does; if for no other reason than it is the unique story of one of the most famous Wehrmacht regiments of the Second World War. Unique because it was there from the erliest days of Hitler's planning for war and was in action in Poland, Holland, Belgium and France, North Africa and subsequently on the Eastern Front. The author, Bernd Hartmann, a retired Oberstleutnant in the Bundeswehr, is an official spokesman for Panzer Regiment 5's Veteran's Association. He is well qualified, therefore, to write a history of a tank unit that epitomised the Third Reich's military might. Its 10 year span is split into two. 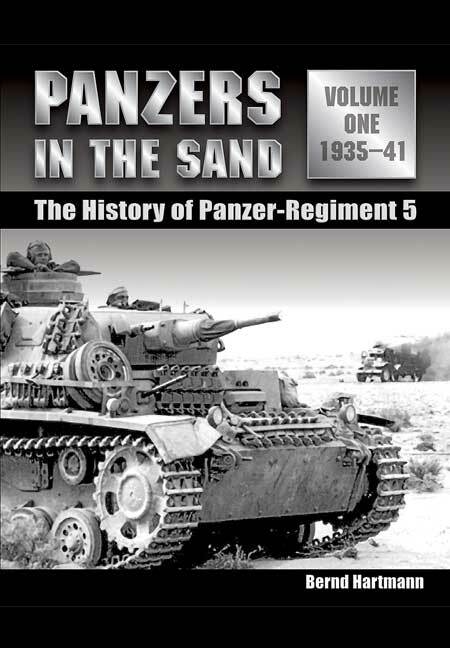 This first volume covers the period from 1935, when Panzer Regiment 5 was formed in W_nsdorf, south of Berlin, until Tobruk and Operation Crusader in late 1941. As an aside, it is interesting to note that the Regimental Headquarters and 1st Battalion were based in Cambrai Kaserne! The second volume, covering the period 1942-45, will be reviewed in the next issue of the Tank. Most readers will know something about Blitzkrieg tactics, the German Generals who became household names, and the tanks, often formidable, that we faced in France, North Africa and during the final phases of the War. Few of us are so conversant with life at regimental level when training for operations. Few of us are so conservant with life at regimental level when training for operations and in action itself. For this reason alone it is worth reading. For the military historian, this profusely illustrated book provides a factual historical record that can add another dimension to research on particular events, organizations, equipment or influences on decision making. There are three main areas that were of considerable interest to this reviewer. First the extraordinary lengths the Germans went to learn about tank warfare. The Soviet Armour School at KAMA, 750 km east of Moscow, was used to train officers from 1929-33. The selected few - included the the Oberst Guderian - were temporarily discharged from the German Army to ensure complete secrecy. These courses enabled to German Armoured Troops to be built up rapidly from 1935. Doctrinal development and trials of prototype tanks were geared to ensuring that large-scale, combined arms operations were both understood and achievable. This was soon to be proven in action. Secondly, there are several sections on Lessons Learned after major operations. The extraordinary advance through Benelux countries and through France in 1940, covering 5,000 km in 6 weeks, was immediately followed by lessons and recommendations sent through the chain of command. Upgunning and uparmouring certain tanks were deemed to be high priority, as was low-level tactical points about firing at the short halt to increase accuracy. Finally, the several vivid personal anecdotes by German sub-unit commanders and crewmen of life during the operations in the Libyan desert could have been written by a British Tanky. The flies, dust, discomfort and disease were nor respecter of persons or nationalities. German crewman did, however, appreciate our rations - when they managed to purloin some. Maybe the grass is always greener..! This is an informative and enjoyable read that does underline our similarities at crew level. As a former member of the Fifth it was particularly interesting to read about our direct counterparts. This is a very detailed work throughout, becoming increasingly readable as it develops. It should be of interest to anyone looking at the development of the German armoured forces before the Second World War. their deployment early in the war, or in the desert war in North Africa. This is the first in a series of photographic histories about the German tank unit, Panzer Regiment 5. It features unpublished photographs backed by excellent text, beginning with the creation and evolution of the German Panzer Arm from pre-war training in Russia to its expansion in Germany following the Nazis arrival in power. The development of kit and the tanks is also addressed, as is their usage in conjunction with the infantry, dive-bombers and artillery. The actions of the Regiment in the Czechoslovakian, Polish, French and North African campaigns are also explained, again supported by extremely interesting photographs. This book will appeal to both those who have a general interest in German armour, and others looking for a detailed, high quality publication on the subject. The first of a 2 volume set originally published as a German edition but now an English translation has been done, following the history of Panzer-Regiment 5. The author was too young to have served in WW2, but did serve in the Panzer troops after WW2 and chose to write a record of one of their longest established Panzer units. Spread over 2 volumes, he sorts out the conflicting accounts and recollections of events to establish the best truth of events and prepare a fine history on the unit. Making use of records plus a lot of opportunities over the years to get accounts from veterans, many of which you find throughout the book. First published in German in 2002, these two volumes are a comprehensive history of Panzer-Regiment 5 by a veteran of the formation. The unit was among the first of the new Wehrmacht to be equipped with tanks back in 1935 and it took part in the Polish and French campaigns. The unit is most famous, however, for its deployment, in March 1941, to North Africa where it formed part of first 5 leichte Division and then 21 Panzer Division. Following its defeat in Tunisia in 1943, the regiment was reformed (equipped with Sturmgeschutz lll) and fought on the Eastern Front, before (this time equipped with Panthers) fighting as part of the new Panzer brigades in the West. The regiment ended the war as part of 25 Panzer Division north of Berlin. This really is a cracking read - a mixture of good old fashioned military history, personal anecdotes and technical information. Both the men of the regiment and the machines they fought in are given equal attention and both volumes are illustrated with many period photos, many of which are unseen. The bulk of the two volumes is devoted to the fighting in North Africa and this is essential reading for any students of the Desert Campaign. The photographs of Panzer lll's, heavily modified by the regiment in the field, provide perfect inspiration for anyone tacking any of Dragon's new kits, while there are enough new images here to whet the appetite of most Panzer fans. Overall i can't recommend these volumes highly enough. 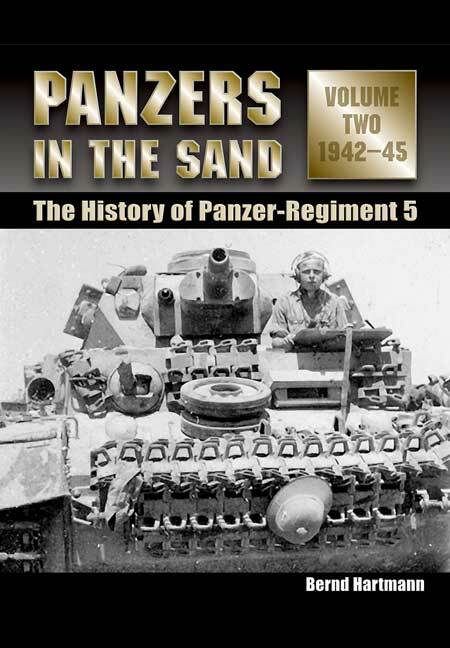 Panzers In The Sand, is the first of a two volume history of Panzer Regiment 5. A minor irritant is that this book has been translated into English, from German, by an American. Occassionally the translation (such as the letter home from an Afrika Corps soldier, complaining that he was ignored as a 'newbie') sounds silly. The book also uses the irritating Americanism describing tank crewmen as 'tankers', instead of the British expression 'tankies'. Now that I've got that off my chest I can happily say that this is a truly fascinating account of life in an armoured regiment during its formative years, between 1935 and 1941. Overall, the narrative is well informed and interesting. But what really makes this book stand out is the wealth of photographs, illustrating daily life for the soldiers and showing the regiment in action in Europe and Africa.